Photograph depicts houses on the beach at West Bay.Heavy foliage in foreground of image; houses and driftwood lining the coastline; peninsula of Stanley Park in background. 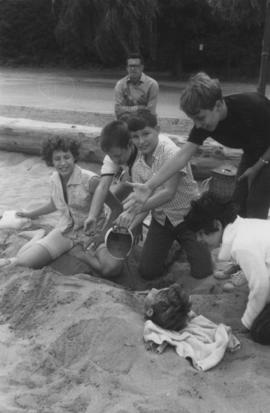 Photograph depicts children burying a camp councilor in the sand.Written on the verso: "Summer Adventure Camp 1971. Fun with councilor + kids at the beach." 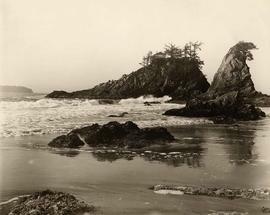 Photograph depicts a man with a dog on Caulfeild Beach in West Vancouver.Man with dog on beach in foreground of image; water in right of image; houses along coastline in background. Photograph of Morris Soskin and unidentified friend on the beach at English Bay.